Small tree growing 5 to 12 meters high. Leaves are pinnate, 20-60 cm long, with hairy rachis and leaflets. Leaflets are opposite, 10 to 17 pairs, oblong, 5 to 10 cm in length. Flowers, about 1.5 cm long, and slightly fragrant. 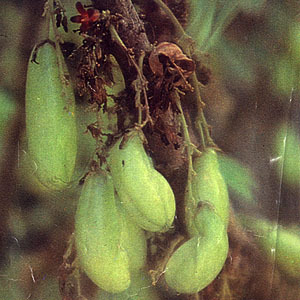 Fruit, green and edible, about 4 cm long, subcylindric with 5 obscure, broad, rounded, longitudinal lobes. Cultvated and semi-cultivated throughout the Philippines. Skin diseases, especially with pruritus: Reduce the leaves to a paste and apply tolerably warm to areas of affected skin. Post-partum and rectal inflammation: Infusion of leaves. Mumps, acne, and localized rheumatic complaints: Paste of leaves applied to affected areas. Warm paste of leaves also used for pruritus. Cough and thrush: Infusion of flowers, 40 grams to a pint of boiling water, 4 glasses of tea daily. Fever: Fruit as a cooling drink. The fruit has been used for a variety of maladies: beriberi, cough, prevention of scurvy. Infusion of leaves also drank as a protective tonic after childbirth. Fruit used to remove stains from clothing and for washing hands. A common seasoning for sweets and pickling. This entry was posted in List of Medicinal Plants in the Philippines and tagged Kamias on March 19, 2009 by Pinoy Herbs. Hello, I have just stumbled upon your blog searching on online as I am looking for some information on yeast infections. Looks like an interesting blog so I bookmarked this site and I will revisit tomorrow to have a proper read when i have more time. Thank you. hi! i just stumbled upon your site… it’s very informative. though i think “ginger lily” is the common english name for camia, the flower related to the ginger family (the scientific name is Hedychium coronarium according to the wikipedia). i don’t know the common english name for kamias, though. I think you have mistaken kamia from kamias. Kamia is different from kamias (see http://stuartxchange.org/Kamia.html). Kamia (Hedychium coronarium) is a plant under the family Zingiberaceae while kamias (Averrhoa bilimbi) is from the Oxalidaceae family (see http://www.stuartxchange.org/Kamias.html). I agree with jeipacumo. I was confused because there are inconsistencies with the informations on kamias. According also to Dr. Roberto Coronel, the scientific name of kamias is Averrhoa bilimbi. The english name of kamias is actually cucumber tree. Anyway, this is just to give the people the correct information. At least with this, we all learned also. 🙂 Thanks! do you have any study about lemon grass? please post if there’s any. i need it for my post graduate thesis, thank you very much..
We have an a investigatory project about kamias.My classmate told me that we can use the fruit as an deodorant.It’s that true? Do you know how to test it? If it works? hi! we have a investigatory project and my classmate suggest that we can use the fruit of kamias as the substitute battery for the calculayor. is this true? im just wondering, what are the chemical components present in a kamias juice and what is it pH concentration? hello,were going to use the ginger lily as our investigatory project. What are the benefits of ginger lily? is there already a conducted experiment about kamias battery in the phil.? or in other countries? Guys,pls do correct this post.. i agree with jeipacumo.. please do visit our National Museum, BOTANY DIVISION and be informed. Thanks guys for informing me. I’ve already corrected this post. thanks for the info. big help! rust stains in cloths especially the white ones can be removed by the juice extracted from camias. I have been doing this for a long time. It really removes stains especially those caused by rust.